According to the National Sleep Foundation, 74 percent of American adults are experiencing a sleeping problem, and more than one-third are so sleepy during the day that it interferes with daily activities. There are some sleep disorders that not only disrupt your quality of life, but can also be dangerous to your body. The Tempe St. Luke’s Hospital Sleep Disorder Lab is a sleep laboratory that diagnoses and treats potentially serious sleep disorders. Patients at the Sleep Disorder Lab are tested in the comfort of a private bedroom located on the campus of Tempe St. Luke’s Hospital in a painless, overnight sleep study. During this process, brain waves, muscle activity, leg movements, heart rhythms, and other body functions are monitored by a skilled sleep technologist. The data is then scored, interpreted by a sleep specialist, and sent to the ordering physicians who will recommend an appropriate treatment plan. 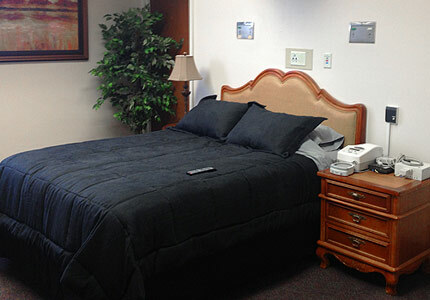 To make an appointment or referral to the Tempe St. Luke’s Hospital Sleep Disorder Lab, contact 602-765-1620. Most insurance plans are accepted.